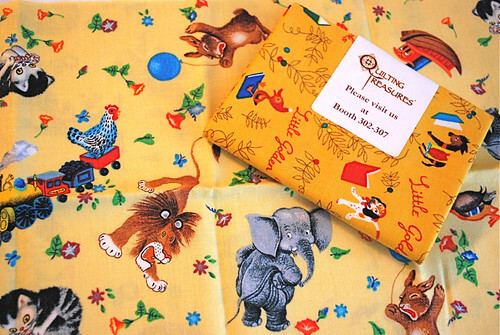 Fabric 2 point faux - Stop staring and start sewing! I have to say it's getting very hard to blog right now. See I wanted a book to read on the plane ride home from Pittsburgh so Joey got Twilight for me and I'm having a hard time putting it down (I'm just past the halfway point). But I will try here (because I don't want to disappoint anyone, right?). While in Pittsburgh we stayed at the Omni Penn hotel and wow, is it beautiful. Chandeliers, marble, brass, just gorgeous. 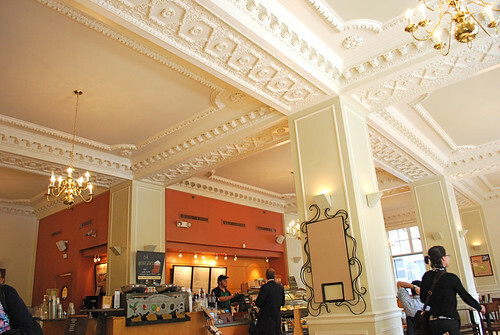 This is the Starbucks on the bottom level! Glorious! Here are Myrinda (Fabric Hound) and Bari (I think Bari's tweeting) taking a time-out with me at Starbucks. I've been whining for an iPhone since I saw everyone tweeting during market..."but Honey....all my friends have one!" Market takes a real toll on your feet so these sitting times were a sweet relief. Here is Bari in her booth for Windham. 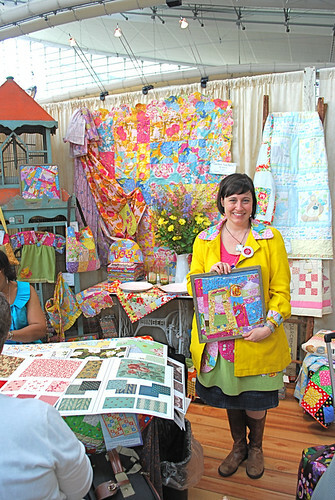 She received the stack of her fabrics while we were at market so all of her displays were made with the strike-offs she had at home (every last scrap!) but you would never have known it. It all looks so colorful and fun! Check out her coat in this post, and then look at this picture and see what she's done to it! I just love creative people! Here she is with visitors Genevieve Gail and Kay Whitt. Actually Genevieve wasn't visiting since her display for her new line Flower Bucket (check it out on her blog!) was right next to Bari's display. Okay, when I found out there would be no fabric 2.0 party (sob!) I contacted Patty Young and offered to put something together since the party task had been delegated to her and I knew she was swamped with building a booth and getting all her stuff ready. Joey and I looked everywhere for a cool place to meet but we finally gave up and said "let's just meet in the lobby of the Omni". It turned out to be a perfect location! Gorgeous ambiance and a couple of restaurants/bars to choose from. Nice! A seriously star-studded event in a relaxed setting. We were all pinching ourselves! 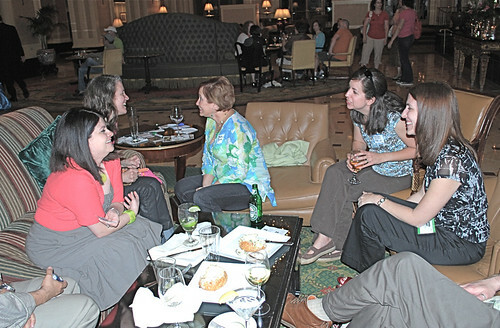 Here are Patty Young, Jenean Morrison, Paula Prass, Mary Beth (from True up) and Jessica Levitt. Heather and Laura showed up. 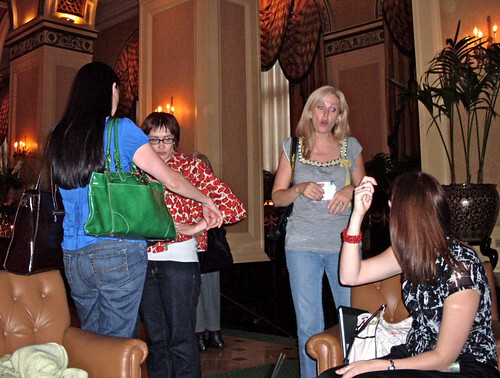 They were staying at the hotel too and Heather had just gotten off her plane so I'm sure she was exhausted but we grabbed her anyway! 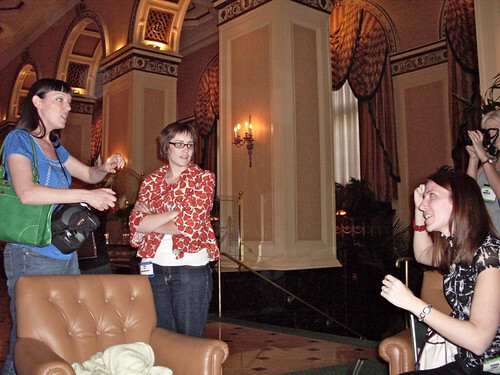 Here they are chatting with Jessica (while I sneak some pics). 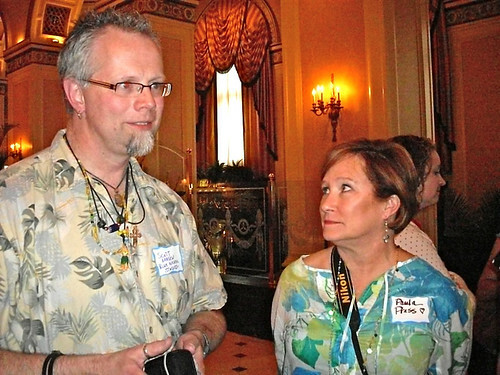 I love this picture of Scott Hanson and Paula Prass! I met Scott and said "Wow! You're much taller than I expected (I think he hears that a lot)!" and Paula is petite so it's funny seeing them standing next to each other (you can see Sandi Henderson in the background behind Paula). 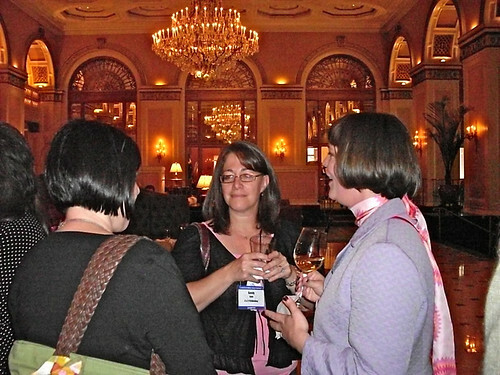 Here are Bari on the left, and Susanne from C & T publishing on the right. I didn't catch the name of the gal in the middle but I think she's Sandy from C & T (I'll try to track down that info). We had a great time running into Susanne in the halls at market! She's really lots of fun and has a great sense of humor (and fabulous neck scarves!). 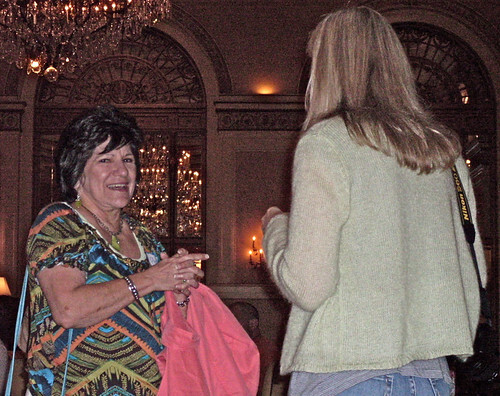 Here is Phyllis Dobbs chatting with me. I met Phyllis on Twitter (What?! You're not tweeting??? You're missing out then!) and went to her schoolhouse presentation on trends and fads where she did a great job educating us and showing us her darling new designs. Nicest lady! 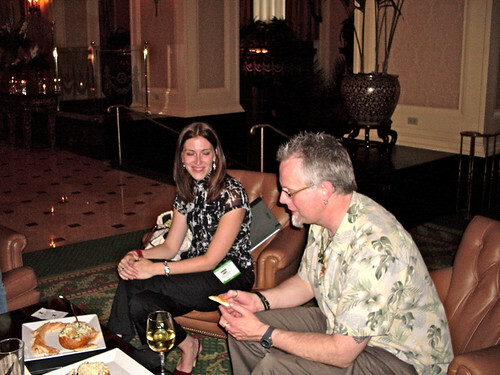 Okay, here are Jessica Levitt and Scott Hanson and if I were you I would bookmark their blogs and keep an eye on them so you can say you were following them back before they became truly famous. That's all I'm saying so don't pester me for details because my lips are sealed, so there! Here are Joey and I sharing a chair (a chair was quite a commodity at this gathering!). I took this picture from Jessica's blog (I hope she doesn't mind!). Here are Jen McLean (Tula Pink!) 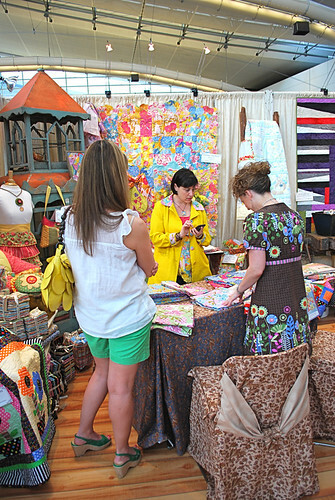 and Myrinda chatting about the new Tula Pink collection from Moda (gorgeous of course!). 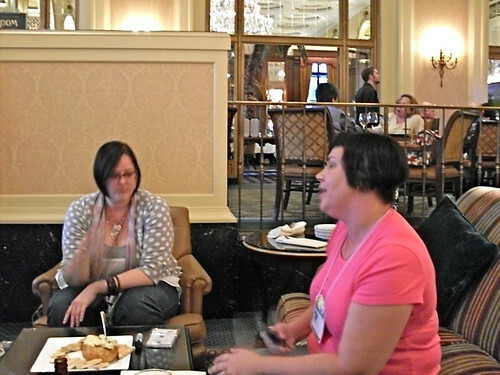 Myself chatting with Jenean Morrison. It was such a treat to spend time getting to know Jenean! She is so sweet and humble and I could spend hours picking her fertile brain! Here's a little Pittsburgh history! I would love to spend a week here just visiting cemeteries (I love cemeteries! ), and historical (we're talking Revolutionary era) sites. 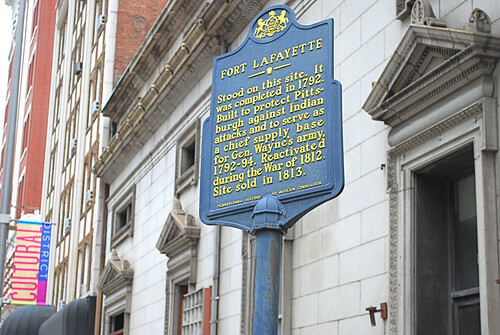 I mean, here we were eating delicious pizza by the slice in a dive just across the street from the site of Fort LaFayette! Amazing! 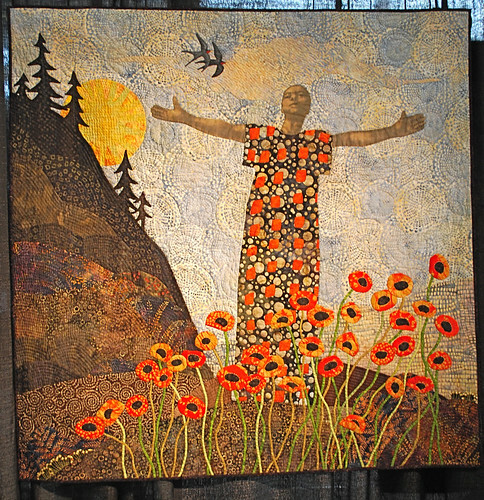 Here is a stunning quilt called "Celebration" by Marlene Shea. This is one of those works that just causes your emotions to rise up. Beautiful. Okay, the winner of yesterday's picnic basket give-away is Jenny who said " Great pictures! Thanks for sharing!" at 6:46 pm on 5/18. Yay Jenny (have "your people" contact "my people" and we'll get this out to you! Ha!). Lots more pictures tomorrow! Booths, celebrity sightings, fabricky stuff! Weeeeee!